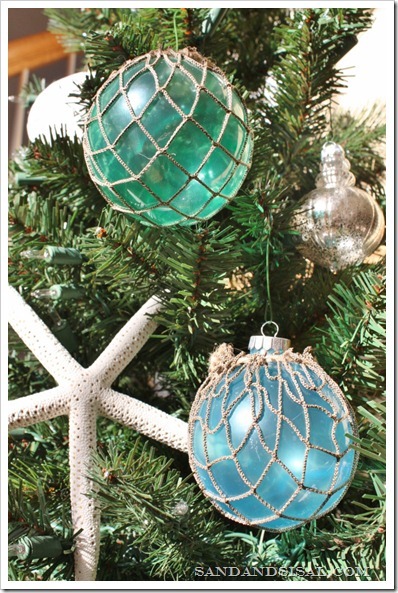 I’ve been tinting my own Mod Podge for years, like you can see in these Glass Float Ornaments. 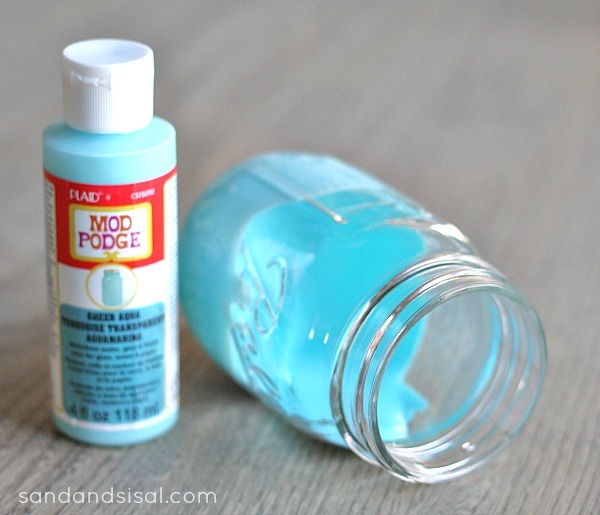 If you don’t feel like mixing your own, this is your lucky day because Plaid has just come out with 9 transparent Mod Podge colors in convenient bottles. These sheer colors can be used on glass, wood, metal, and more. I want to show you 3 different techniques for applying the Mod Podge. Pour & Coat: This method creates a darker and smoother tint. 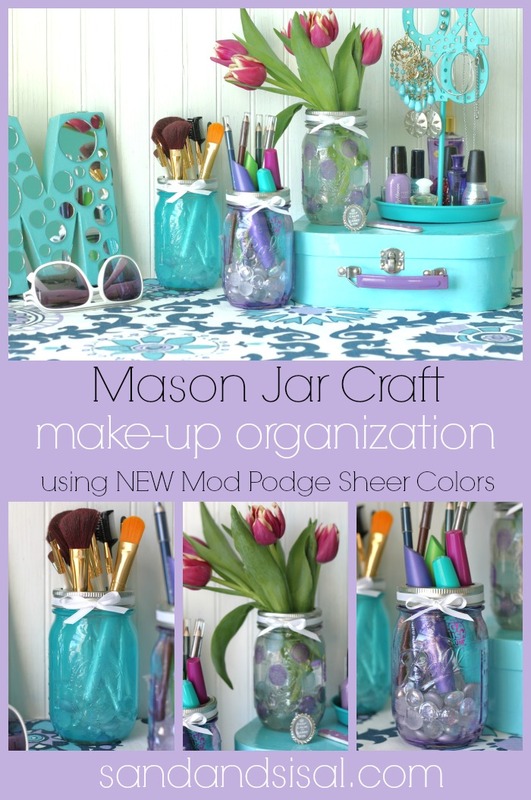 Squeeze a few tablespoons of the colored Mod Podge into a clean mason jar. Turn, twist and swirl the jar, ensuring the entire inside is coated well. Allow to dry completely. My jar took less than 24 hours. I recommend rotating the jar a few times while it is drying to prevent pooling. 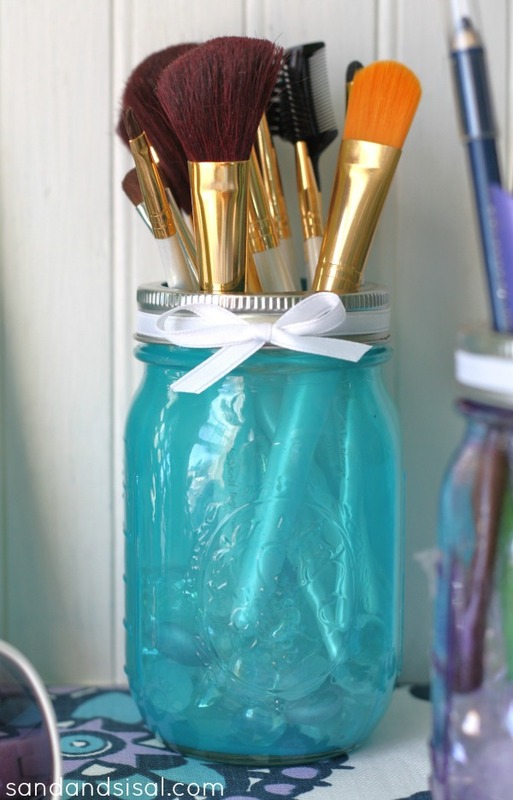 Brush On: Apply the colored Mod Podge with sponge brush to the interior of the jar. The method of application will leave a very light and sheer tint. Some streakiness may also occur, but once dry, it isn’t as noticeable. The Mod Podge will dry very quickly too. 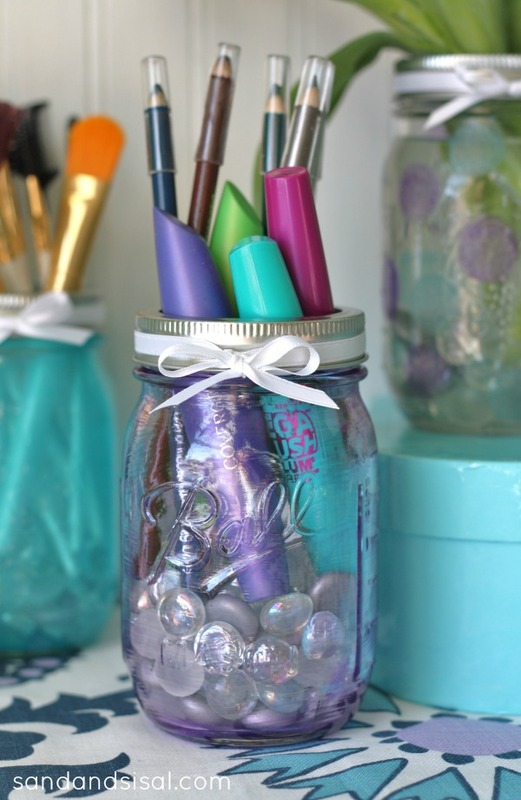 Polka Dots: Use a round sponge dabber to create polka dots to the outside of the jar. Apply more layers of Mod Podge until your desired depth of color is achieved. 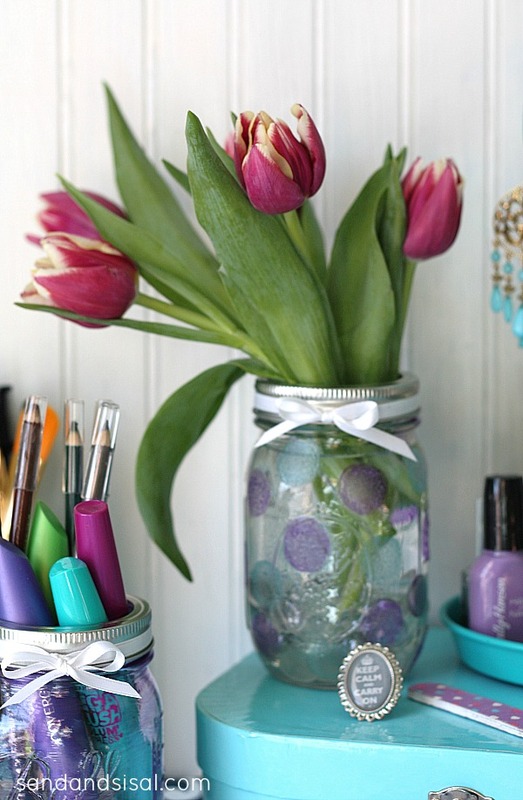 Because the Mod Podge is water soluble, apply it to the outside of the jar if you plan on using it as a vase to hold flowers. 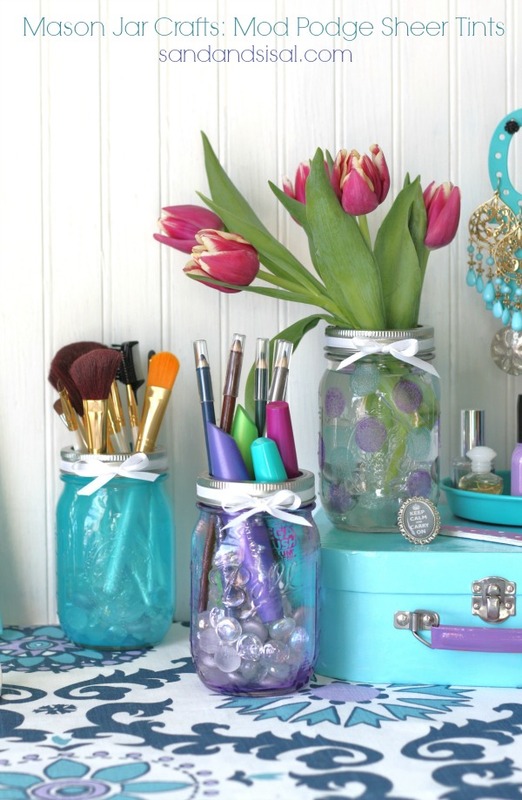 We filled the pretty jars with my daughter’s make-up brushes, liners, mascaras, and flowers. 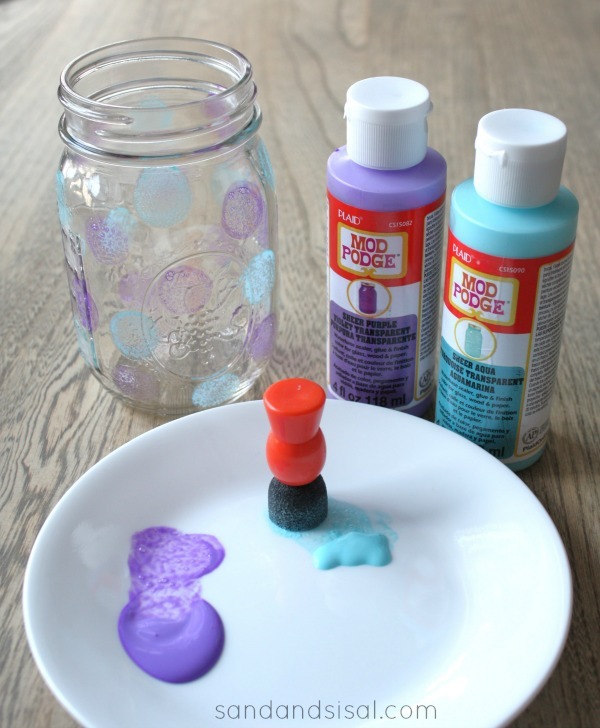 The Mod Podge Sheer Colors can be found at Michaels or on Plaid’s website. Or check out these videos: How To Tint Glass with Mod Podge Sheer Colors and Learn How To Use Mod Podge Sheer Colors. You can sign up for Plaid’s weekly newsletter for tutorials and inspiration or get more Mod Podge ideas on Plaid on Pinterest. These are so cute and make me ready for spring! LOVE the colors and the great tips and ideas! Oh, my goodness, Kim, I am SO doing this! 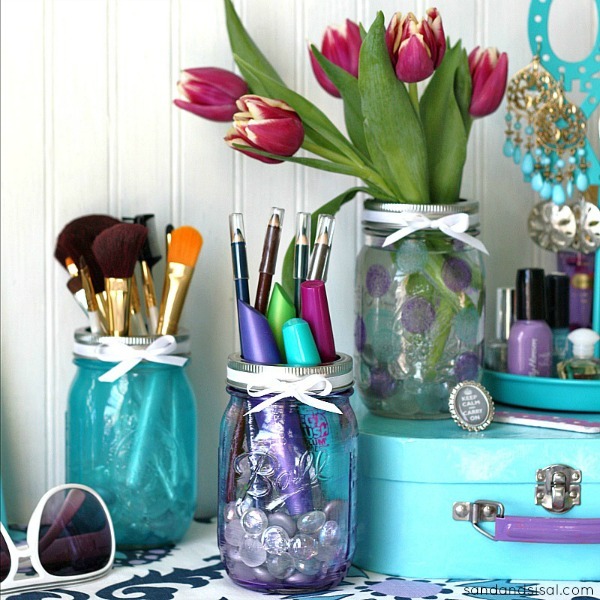 I collect mason jars like a hoarder and I love finding new ways to use them! This is very cute! I’m sure your daughter loves it! Such a pretty project, Kim!! Love it!